La casa del Rigattiere is situated in the historical centre of one of Tuscany's delightful walled medieval villages, this beautifully appointed apartment is positioned in the historic centre of the once fortified village of Castiglion Fiorentino. It was built on the towns medieval walls in the 40's and is close to all amenities. There are 30 free car spots on the street and ample free parking in the town. 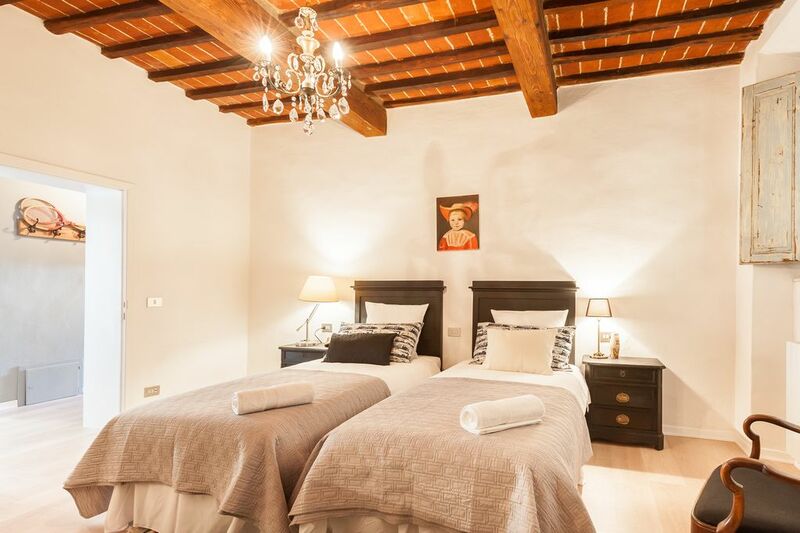 The apartment is on the first floor and provides sleeping accommodations for 6 guests with two large double bedrooms (one with original wood beams), one with a king sized bed and twin, the other with 3 twins two of which can be connected to make a comfortable queen size bed. There is a full country style kitchen with original exposed wood beams equipped with microwave, stove, oven, fridge and coffee machine. A large bathroom with huge walk-in shower is off the living area. This apartment provides the perfect base to explore the historic and picturesque towns of Arezzo (the City of Gold), Cortona (Under the Tuscan Sun), Siena, Montepulciano, Montalcino, Assisi, and Pienza. Trains run from Castiglion Fiorentino to Rome (2 1/2 hours) and Florence (1 hour) several times daily. In addition to its ideal location, this home is perfect for families wishing to visit their children at the Santa Chiara Study Center as it is located within a few steps of the Centre. Please check my reviews at my other properties. I always aim to satisfy guests and love doing what I do. Trust me, this apartment will be worth it! I am Australian from Italian descent and have been living in Castiglion Fiorentino for 20 years. I am passionate about this community and it's surroundings and love to see people enjoy what it offers and walk away enriched with culture and memories of their stay. I am always available for advice and suggestions for your itinerary so please do not hesitate to ask me. This property is a culmination of ideas, products and items which were all sourced locally. I love giving old things new life and meaning which is why you will find unique objects and furniture. All items can be bought to take home, just tell me what you're interested in. The best part of this apartment is that it is completely newly renovated, has air conditioning and fast wifi, all kitchen equipment necessary to bake, cook and grill and you can park the car just in front of the apartment to load and unload without stopping traffic. There are over 30 free car spots in the street, not many residents so quiet yet close to bars, shops and restaurants. You will not be disappointed! Large bathroom with big shower, bidet, WC and basin. There is a laundry room off the bathroom with washing machine and hanging space in front of a big window. Air conditioning is available for 5 euro a day. Unfortunately we need to charge as some past guests used it 24/7 with the windows open, bill was huge! Freshly laundered and pressed cotton bedsheets provided. Washing machine available in laundry area off bathroom. Freshly laundered and pressed cotton towels provided. Living room equipped with 4 seater lounger, 6 seater oval table TV and a gorgeous view of the valley! Full refrigerator with freezer unit. Packet of pasta, biscuits and coffee pods to start you off. Salt, pepper, oil and vinegar plus non perishable extras that previous guests may leave. Everything you need to cook and bake. National TV available with USB connection. Tennis courts 500 metres away. English speaking driver available on request from 100 euro a day plus gas (within a 70km radius). We could not have chosen a better spot for our home-base during our two week trip. Practically everywhere we wanted to go was within driving distance, and the town of Castiglion itself was a treasure we would have missed seeing. Kristina is friendly and accommodating, her thoughtful suggestions helped to make our stay the best it could be. Thanks for making our visit a memorable one! Great stay in a beautiful location. Short walk to the city center. Kristina helped in providing a wonderful experience during our two week stay in Castiligon Fiorintino. Spacious apartment clean and well stocked for all your needs. Plenty of parking nearby was greatly appreciated. We will be returning in the future. Kristina has thought of absolutely everything. House is decorated thoughtfully and with care to every amenity a traveler could possibly want Beautiful small little touches through-out makes it feel like "home" Beautifully decorated. Top-notch linens. Spacious, Bright, tranquil. Everything you could possibly want for your vacation. And Kristina is marvelously professional. Questions for dining or just about anything - she is more than happy to be of assistance. FIVE STARS!!!!! Outstanding apartment with massive charm! Kristina's flat is lovely. With views out over the surrounding hills and all the comforts of home, this is a great place to stay to get away and to treat yourself to a real Italian holiday. The apartment is spotless and the amenities abound. Thanks for thinking of everything, Kristina! I hope you can come back some time in the future to have a chat over a bottle of red. Kristina was a wonderful host and provided a lovely vacation rental with everything we needed to feel at home. The house was decorated with special care and is so much more spacious than we expected from the photos. The location was perfect and the views were spectacular. It was a wonderful holiday and I will certainly come back again to La Casa Del Rigattiere. Thank you Lisa! It was a pleasure meeting you and your sister Linda. We hope to see you again one day in Castiglion Fiorentino. Beautiful flat that is actually part of the old town wall. This is a lovely flat that is located less than 300 yards from one of the old gates of Castiglion Fiorentina. Two extra large bedrooms and one beautiful bathroom with a walk in shower. There were two couples that stayed in this flat and we found it to be airy, spacious and warm. I highly recommend this flat and Kristina. Thank you Randy! It was a pleasure meeting you, Cathy, Lisa and Bob. I hope you all created some beautiful memories in our little corner of Tuscany.